Oracle SQL Plan Management (SPM) is a feature in Oracle Database that captures all the historical execution plans for a query. 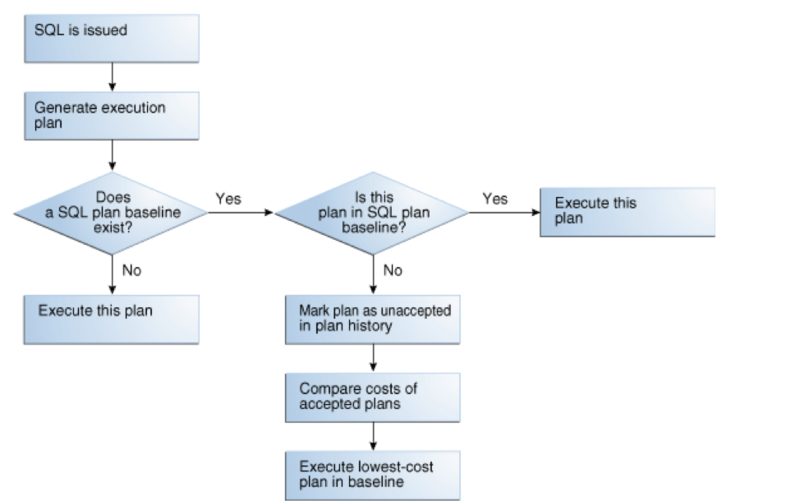 With that, you can create a baseline for the good plan from the execution plans available in SPM and enable that baseline to ensure that the system picks only the good plan from the baseline. To take advantage of this feature, you must identify the sql_id of the query that is performing well on one instance and performing poorly on another instance. You must also capture the good execution plan ID, the plan_hash_value, of the query on the instance where it works well. Run the query on the source instance, where the query works well, so that the query exists in the cursor cache. On the source instance, load the SQL execution plan for the query from the cursor cache to SPM as a baseline. Create a staging table on the source instance. This table is used to migrate the execution plan from the source instance to the target instance. Pack the source execution plan, or baseline, in the staging table on the source instance. Transfer the staging table from the source instance to the target instance by using the export/import utility. Unpack the SQL plan on the target instance from the staging table to SPM. Verify that baseline created on target instance is fixed and accepted for the query to select it on next run. Test the SQL that had a performance issue on the target instance and verify that it picks the transferred baseline. Executing the preceding steps results in output similar to the following examples. Execute the following defined queries to verify that you created the SQL baseline on the source instance. Note the following details for later reference. Execute the following commands to unpack the baseline from staging table to the target instance's SPM. In the following example, take a count before unpacking the baseline to verify that the baseline was imported properly on the target. Run the following commands on the target instance to verify that the baseline is accepted and fixed. The preceding output shows that the baseline was imported on target instance but that it is not fixed. Run the following query to fix the baseline and enable the optimizer to pick only this plan. Use the steps in this post if you have to transfer the baseline for a single query. You can also generate SQL baselines for all the queries for upgrades, migrations, and so on. Use an SQL plan baseline to have consistent SQL execution plans and to avoid any performance issues.